Last week I decided to finally get round to making the water wall I brought the parts for ages ago! My Little Tots all love water play so I decided an easy DIY Water Wall would be perfect for them. There’s so many amazing ones on Pinterest but I wanted a really simple one that wouldn’t look out of place in my garden in which I try to keep brightly coloured plastic to a minimum. Whistle tubes can be quite hard to find, I found these in Asda for £1 each and they’ve also been spotted in B&M and Wilko’s for around the same price. The ones I saw on Amazon were very expensive so it’s worth hunting round the shops for them. The first time we played with this it was still pretty cold so it was coats and wellies but the rest of the week has been glorious and the water not so ice cold so it’s been played with for a lot longer. To make this water wall I simply attached the tubes to my fence using the cable ties. I made sure that they were low down enough that my smaller Tots could reach to pour water in and spread out enough that two or three little ones could get in and play at the same time. At the bottom of the tubes I added some washing up bowls but any type of bowl or container would work well. I then added some plastic jugs and cups and the Little Tots added some small bowls, spoons and water toys during their play. I left the funnels unattached so they could move them from tube to tube as they pleased. This water wall was at a perfect height for the two non-walkers I care for to practice pulling themselves to standing and start to stand up with no support as they needed their hands to pour water. This is a great gross motor activity and it took a lot of practice for Baby J to pour a cup of water down the tubes but he got there eventually. Because of the ridges in the tubes this slows the water down when so it wasn’t pouring at too fast giving the Little Tots plenty of time to watch it trickle out and even try to catch it with a jug or cup at the bottom. If you didn’t want this as a permanent feature in your garden you could also attach the tubes to a garden trellis so you can remove it when not in use. I’m linking up this post with the Kids in the Garden blog hop hosted by the lovely LarabeeUK so don’t forget to check out all the other fab garden posts by visiting the links below. 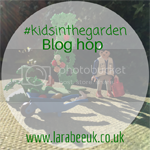 Bloggers if you have a kids in the garden post to link up simply add the badge code and link up your post. Don’t have a blog? then why not sure your pictures using the hashtag #kidsinthegarden on your social media and share with us what you’ve been up to.